Match A Resident is the #1 choice for the International Medical Graduate (IMG) residency candidate. The unique platform helps you apply smart by generating the most reliable and up-to-date Customized Residency Programs List in any of the 18 most popular specialties for IMGs. Learn detailed program requirements for IMGs, Visa Status, USMLE Exam scores and more. All updated annually for you. Save your precious time and leave the program research to us. Focus on completing your ERAS Application and other important documents. Get superior residency support. The professional Support Team will answer any of your residency questions. I was very impressed with the attention I got today from Match A Resident. The service offered is really helping me, because I really do not have the time to call all the programs. Also it gave me a better perspective of what to expect. After seeing these lists, things have started looking better, not only because now I know which hospital to look for, but also because now I am more positive about getting interviews. This process is so stressful that anything to help our mood is welcome! Keep up with the good work. I am an old grad with average scores and needed a visa. I just would like to thank you guys for providing me the customized list which gave me 7 interviews and a prematch! I wouldn't have discovered those programs easily without your help. And I think I saved heaps of money by only applying to the programs I am qualified in. MAR staff are amazing to work with when I called them they recommended me to apply for ERAS. I was thinking I am running too late. MAR have answered all my questions. I never thought I could apply for surgery but matched a good number on match a resident which gave me the confidence to go for it. Three interviews on the way for November! I was going crazy trying to figure out where to apply, I called so many places but besides being a slow process it was overwhelming. With a suggestion of a good friend I got the list for IM, within few minutes of reviewing the list of programs I was so relieved to see the programs listed on it, with a great confidence that I can apply here knowing my profile matches their criteria. There were also so many programs in my list to apply which I would not have even thought of applying before. Staff at MAR is Excellent, and the list is worth getting it, period. I did not know what to do before I discovered Match A Resident site. I did not only get a custom list but also got the support I needed. Great Job and professional staff. I got match in Pediatrics in March 2017. Thank you! Before a good friend told me about MAR I was sitting in front of my computer for hours, day after day, looking up every single Family Practice residency in each state to see if I should bother applying. Then I found out about MAR. About a week after purchasing the lists I was done with the application process and was already getting interviews. I have gotten four interviews so far and they are all in places that I applied to from those two lists. MAR is worth every single penny and more. It made the application process so much easier for me and I wish I knew about it about months ago. Thank you MAR!! MAR is a must have before sending residencies to ERAS. The price is too low for the benefit. I purchased and IMG friendly list for the same price from a website 2 weeks ago and it was nothing but a waste of money. Now with my customized list I got results. IMG friendly list was given free with match a resident. Appreciate the great customer service. MAR is a must have service! I have used them for their scrambling services and for getting the customized lists. I feel that they have outstanding service and their rates are very reasonable. Those lists saved me so much time and money! I highly recommend MAR for all of its services! Match A Resident’s Residency Program Filtering Algorithm will guarantee you a strong list of programs. If you are an US International Medical Graduate (US IMG) or Non-US International Medical Graduate (Non-US IMG), it’s important to know which programs are IMG friendly to target your applications. Each Specialty List is created from your Applicant Criteria and based on the most relevant professional credentials for IMG candidates such as USMLE scores, Visas, Time Since Graduation, and more. 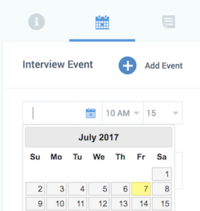 InterviewLink (I-Link) shows members the residency programs that include interview feedback or previously scheduled interviews from candidates with Applicant Criteria similar to your own. ECFMG certificate is required by time of application. 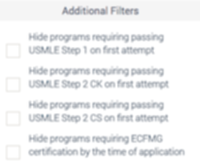 USMLE Step 2 CS is required by time of application. PTAL (California Status Letter) is required by time of application. All residents receive solid training in basic clinical skills, including comprehensive history and physical examination, thoughtful evidence-based problem solving and development of lifelong learning skills. They focus on evidence-based medicine and emphasize an academic approach to problem-solving. Twenty-four-hour access to computers for database searches is available. Average program overall. I was interviewed by 2 doctors. I was not asked any medical questions; they just really wanted to get to know me as a person. Residents were very friendly and they all seemed to know each other very well. The interview day structure was very standard - a presentation in the morning by the PD and the chief resident followed by interviews and a tour. The day ended with lunch in the cafeteria. Loved the hospital, the residents and the city. Dinner the night before was intimate and a great feel of the program. Interview day was relaxed. Post interview get together arranged by the program. Only downside is limited in house fellowship. Would have been more than happy here. The interview was wonderful, the program director is an excellent person as well as the medical staff, they made me feel great, comfortable and confident during the whole process. Show them why they should pick you up as the best candidate. Make an extra effort to demonstrate that you really want to work with them and you love Internal medicine. The interview was conducted in a relaxed atmosphere. PD and the other two faculties interviewed us. General questions and medical questions were asked. Overall the interview was not very well organized. A lot of waiting time. But the PC appeared to be very nice and considerate. What Type of Candidate Are You? Each residency candidate has unique circumstances and travels different paths to residency. But, some paths are easier to walk than others and more likely to lead residency candidates to their successful Match. I was very impressed with this program, the facilities, the faculty members and so on. They have an exam during the interview, but is very easy if you have had US clinical experience (I thought they were mainly testing this and seeing if you know how to work in a US system, even though they asked other general questions as well). I stayed the night with a resident who was very informative. The interviewer's style was friendly and always to keep you as relaxed as possible. I had a very non-stressful experience here. A small nice community program. Interviewed with about 2 other candidates. On interview morning, transported from hotel to morning report after with a resident gave a tour of the hospital. After the tour we were then taken to the clinic site where the program coordinator gave a presentation about the program talking about visas and contract benefits. Clean hospital with polite staffs and happy residents. Mostly IMG residents. Interviewed with the PD and 2 attendings - no medical questions. Lunch was provided with some resident and faculty in attendance to answer any other questions. Lovely city. I was interviewed by 5 different people, residents and faculty. Generally a nice area to work, small town of about 5000 but friendly area. Good program, well funded. Very strict and by the book. I heard that the PD has changed this year. The last one was nice, but seems like they are looking for something very specific. The really watch you closely in the interview. I have a friend in this program and he likes it. The interview was very well organized, very informative about the strength of the program. The program director himself takes all the applicant for a tour around the hospital different departments as well as the new facility. Amazing experience and very good program, everybody was very friendly and welcoming. It’s small knit community program, all faculty are friendly and knows their residents in person. The interview was conducted in very friendly environment starting with morning report followed by program demonstration by program director and tour of hospital. This followed by lunch with resident where i got good chance to talk with interns and residents about strengths and weaknesses about the program. 3 key faculty members interviewed me one being program director. most of questions were based on CV and clinical experiences. overall it was pleasant experience. Interview went very well. The only had one interviewer, which was the residency director. I believe he conducts all the interviews; there were give other interviewees and they were all interviewed by him. The director is really a down to earth nice person. The staff was very nice as well. Questions asked were mainly about what I have been doing and what are my long term goals. I felt very comfortable in the interview and throughout the day. The residents were very friendly and answered all my questions. Very good program director in a solid program. Comfortable interview. Very competitive. The director asked about my motivation and what I thought made me competitive and why I thought I would do well in a program as challenging as theirs. Probably the nicest hospital I have been to, very advanced. The interview day is really fun. Good residents, interviewers and the program director is easy to talk to. Match A Resident gave me great tips to tackle this interview in specific! Join thousands of residency applicants already using Match A Resident.